PALERMO, Sicily (CNS) — Honoring a priest shot at point-blank range by the Mafia, Pope Francis insisted that true happiness and a real change in Sicilian society will come only when people love and care for one another rather than trying to grab as much money and power as they can. “Having always leads to wanting. I have something and immediately want another and another without end. The more you have the more you want. It’s a horrible addiction,” Pope Francis said, celebrating Mass Sept. 15 in Palermo. “On the other hand, one who loves finds himself and discovers how beautiful it is to help others has joy on the inside and a smile on the outside, just like Father Pino” Puglisi, the anti-Mafia priest gunned down Sept. 15, 1993, his 56th birthday. 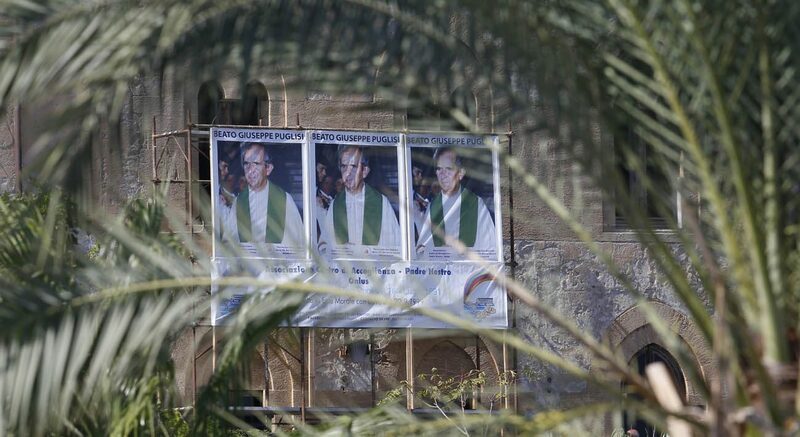 Pope Francis made a day trip to Sicily to mark the 25th anniversary of the now-beatified priest’s martyrdom. His homily and speeches included denunciations of the Mafia and a call for the mafiosi to convert, but he focused especially on encouraging local Catholics to live their faith and to courageously stand up to all forms of injustice, which flow from and feed into the Mafia’s power. And meeting Sicily’s bishops, priests, religious and seminarians in the afternoon, Pope Francis asked for special care in ensuring that the traditional religious festivals of the region’s cities and towns not be used, as they have been in the past, to give a pious varnish to members of the Mafia. Pope Francis began the day in Piazza Armerina in central Sicily, urging Catholics not to resign themselves to the problems in their lives, their families and their community, but not to ignore them either. Strength for building a community that is solid and in solidarity with the poor will come from regularly celebrating Sunday Mass together, Pope Francis told the people. The pope’s homily later at his outdoor Mass in Palermo lasted 17 minutes, but that included several long interruptions for applause. Money and power do not liberate people, they make them slaves, the pope said in the homily. Those who are most free and most happy are those who give their lives in service to others, like Blessed Puglisi did. The pope’s visit to Sicily ended with an outdoor meeting with tens of thousands of teenagers and young adults in a Palermo square. He urged them to dream and to love one another and to fight every form of corruption that flows from or builds up the Mafia. “Promise me: No violence. No bullying,” he said. “No to resignation. Everything can change” if people open their hearts and stand firm in hope.